Add a little dose of health on your next culinary adventure by cooking with Peanut Oil by Heritage Products. Peanut Oil contains all-natural oil derived from US grown, premium grade, edible peanuts. This incredible oil naturally contains vitamin E, a fat-soluble vitamin that helps protect the heart and vascular system, prevent certain types of and promote soft, healthy skin. Peanut Oil can be used as a cooking oil in your favorite recipes, or it can be used topically as a moisturizer, toner or massage oil, to help your skin achieve a naturally radiant glow. Begin your path toward a healthier lifestyle today by ordering your own bottle of Peanut Oil by Heritage Products here at eVitamins! Notes: Contains no cholesterol. Rich in Monosaturates. Recommended Use: An excellent all-purpose oil for use in salads, cooking and baking. Your skin will love it too! Use as a moisturizer and toner, massage oil and in hot oil packs over aching joints. 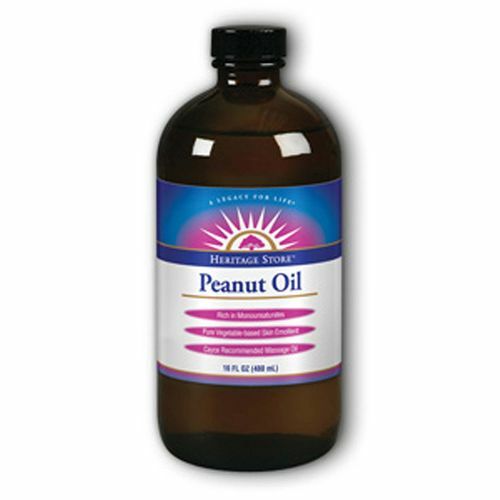 The customer reviews posted below are based on individual consumer experiences and may NOT necessarily represent what expected results will be from using or taking Heritage Products Peanut Oil - 16 fl oz. These results may not be typical and you should not necessarily expect to receive the same results. Actual results may vary. Great for hair, acne, joint pain and more and my puppy love it... but only use in moderation when taken orally.